While I’m always up for a challenge in the kitchen, I definitely appreciate a quick meal. Especially when the meals packs flavour and style, and would be dinner-party-worthy. This meal definitely classifies as such. I’m a huge fan of duck, and any duck fan will appreciate this quick recipe from Fine Cooking. The ingredient listing is simple, as are the instructions. The duck breasts are scored and seasoned, then seared to render the fat. Then they’re flipped and placed in the oven to finish cooking. 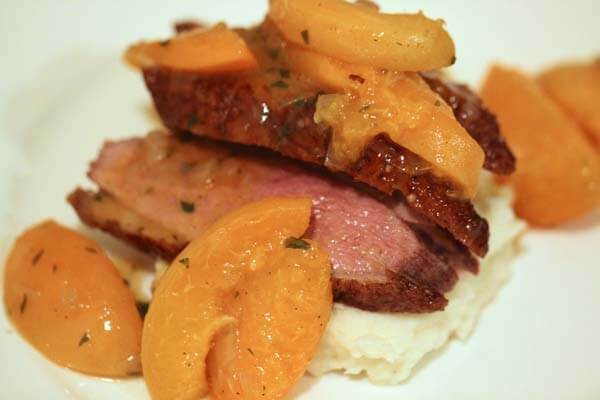 Once the duck breasts are cooked, you remove them from the pan, and throw in the remaining ingredients to make a delicious pan sauce using either apricots or peaches. The sauce only takes a couple minutes, at which point you’re ready to slice the duck and serve with the sauce. It doesn’t get much easier or delicious than that! And it makes tasty leftovers too!